Imagine starting your day off with a large bowl of fresh pineapple and strawberries. Later in the morning grab a fruit smoothie with lots of berries and frozen bananas. For lunch enjoy a melon salad and in the afternoon, treat yourself to some delicious crisp apples. In the evening, ripe papaya and fresh coconut sound yummy and before bed a juicy pear. Most of us know that a fruitarian diet, while an enticing concept, is not practical nor is it even a healthy concept in the real world. But, as you reflect on yesterday’s food choices, how much fruit did you actually eat? Did you start your day off with any fruit? How much fruit did you add to your morning smoothie? Did you add any fruit to your mid-day salad? What other fruits did you have before the end of the day? 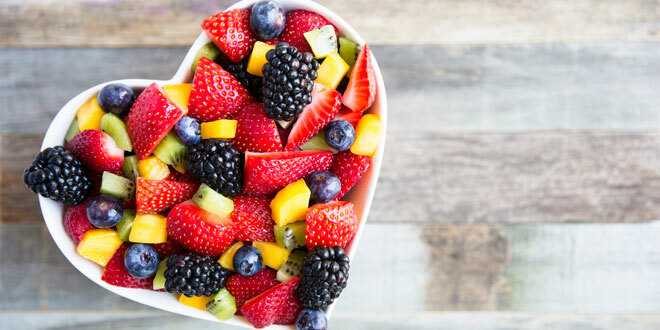 Unfortunately, you don’t have to become a full-fledged fruitarian to have too much fruit in your diet. Albert Mosseri, a natural hygienist, said something interesting about fruit — an observation that came from working with more than 4000 patients. He said that the healthier you are, the more fruit you can eat. People in poor health should favor a ratio of more vegetables and root vegetables vs. fruits. Athletes in excellent health can consume up to 70% fruit. But even the healthiest and most active people should not go above the threshold of 70% fruit in the diet. Sugar comes in a few different forms: Glucose, fructose and sucrose. Glucose helps keep all your systems chugging along smoothly. Carbohydrates break down into glucose, your body’s main source of fuel. Then you have fructose, the only type of sugar found in fruits. It’s metabolized in the liver, as opposed to in the blood stream. Sucrose, more commonly known as table sugar, is simply a combination of both glucose and fructose. High blood sugar, which is caused by too much glucose in your blood, can lead to diabetes. Refined carbohydrates, like white rice or white-flour baked goods, are common culprits leading to high blood sugar. In addition to their sugar content, they lack the fiber that prevents glucose spikes, wreaking havoc on your blood sugar levels. Too much sugar in the blood stream at once leads to fat storage and insulin resistance, a precursor to type 2 diabetes. The lesser-known fact is that fructose, or fruit sugars, can also play a role in the disease. Your liver turns any excess sugar intake into triglycerides that get stored in fat cells throughout the body. The more sugar you eat, the more fat you store. Specifically, too much sugar, even from the fructose found in fruits, can lead to a buildup of that visceral belly fat that has been linked to type 2 diabetes. Did you know that 10% of the US population has symptomatic fructose intolerance? Hereditary Fructose Intolerance is when an individual lacks an enzyme needed in the body to break down fructose. That means their systems have trouble transforming all stored sugar, known as glycogen, into the glucose that your body uses as energy. If you experience symptoms like bloating, nausea and abdominal pain when you eat fructose (fruit) you may want to have your blood tested for this intolerance. Limiting and avoiding foods with fructose, sucrose and other sugars is your best treatment. So how much is enough? Well, assuming that you don’t have a fructose intolerance, a healthy daily amount would be about two servings. That may be the amount you place in your morning smoothie. While we teach that vegetables are the feeders and the fruits are the cleansers, this may not be the best for everyone. If you are battling an illness, or your body is weakened, it is best to consume more vegetables (especially the dark leafy greens) and less fruit. When you eat fruit, it is best to always eat the whole fruit and to never or rarely drink fruit juice. Juicing of the fruits causes the sugars to be concentrated even more. The fiber is removed but is greatly needed to help balance these sugars through digestion. Fruit today is sweeter than it was previously. Through hybridizing, the fructose levels are 30% higher than just a few years ago. Food producers are trying to meet the public’s demand for more sugary foods. Another area that isn’t easy to do, but makes great sense is to eat fruit only while it is in season. Although you can get nearly any fruit anytime of the year, it has likely traveled a distance and may not have the highest nutrient content anymore. Soon, the apples will become a distant memory and the grapefruits and oranges will appear in abundance in the local grocery stores. Mindful eating will take you much further into your healing process as you begin to see that even the so called “healthy” foods can only be healthy for you if your body is healthy enough to receive them. The fructose can feed the undesirable bacteria in you gut. It can feed cancer and contribute to high blood sugar. I agree that eating fruit in season is a good practice. I’ve heard that eating fruit picked too early can be bad for a person’s health also. I’ve heard it is best to eat fruit in the morning. If a person eats fruit at the end of a big meal, later in the day, it can ferment in their stomach when mixed with other foods.